After leaving the busyness of Phomn Penh, we headed south via bus (with actual westerners on- we’ve seen none on buses so far.) Around 4 hours later, we were dropped off in a tiny village, in the pouring rain (with said westerners all looking at us like we were idiots.) Almost immediately, a man shoved a sign in my face with my name on it. Yippee! 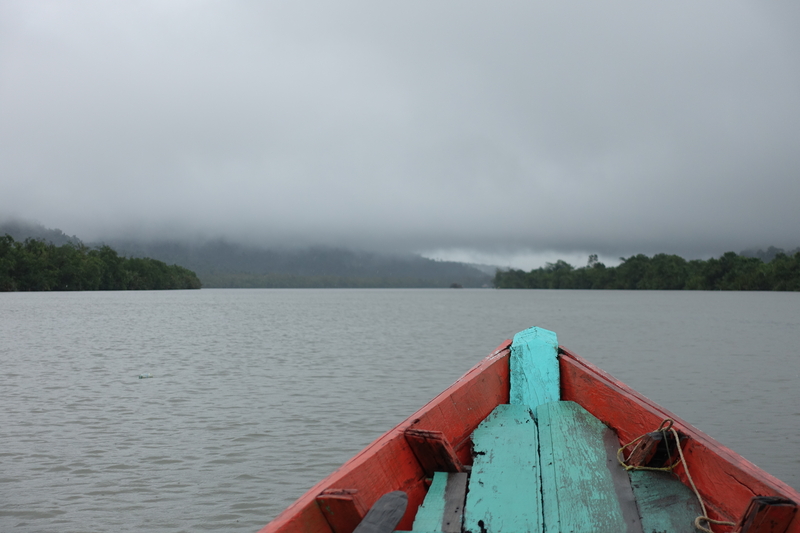 Off we went through the mud and rain to a fishing boat for a beautiful yet wet 2 1/2 hour journey up the Mekong. We arrived at a tiny jetty and with some vague directions from the boat driver (pointing up a hill,) we went in search of a centre of the village of Chi Phat, a small village in the Cardamon mountains. 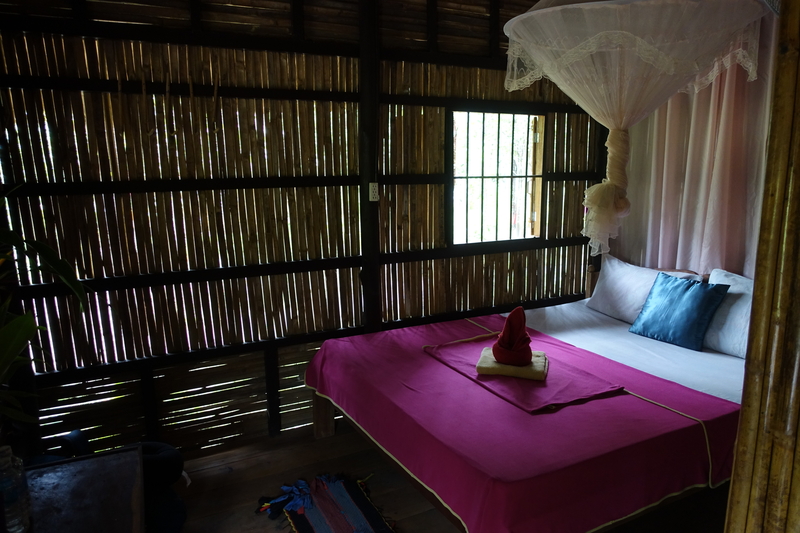 Here they welcome visitors to come and experience traditional Cambodian village life, whilst supporting the local economy. Everything you spend in Chi Phat goes directly to the community so that they can support themselves. We opted for a bungalow, at a hefty $10 per night. And that’s considered expensive here. Homestays are just $3- but with mine and Sam’s hatred of squat toilets we decided to splash out. The village itself is pretty amazing- there’s so much biodiversity and the surroundings are spectacular. We thought about doing a jungle trek (calm down mum, we didn’t) but it’s been raining a lot and we just didn’t fancy trekking 25km soaking wet. We’ve read about people that have come down here for 2 nights and ended up staying 3 weeks- it’s not hard to see why. I think 3 nights for me is enough though, especially after finding Joshua (why not,) the world’s largest spider (in my mind anyway) in the bathroom. I’ve tried, I really have, but I just can’t get over their legs. I keep peeking inside the hut, wondering when he’s going to next appear. As it’s low season, it’s very quiet- which has its pluses and minuses. We went to deserted rapids and a waterfall and walked back through the village that’s littered with cows just chilling in waterholes at the side of the road. I succeeded in convincing Sam that kayaking with me would be great idea (did he learn nothing from our ‘amazing’ kayak experience in Langkawi?) It was indeed great, although we have cemented the fact that we cannot kayak together. Not in the same boat anyway. The food has been amazing. It’s traditional Khmer food and so not something either of us would normally try but so glad we have. To be honest, at $2 a meal we’d probably eat most things. One thing I’ve learnt about myself already: I really really don’t like only having 4 outfits to wear. One thing I’ve learnt about Sam: He overpacks. Massively. How have I never realised this before? Who needs that many t shirts? Why would someone need 5 Apple chargers?